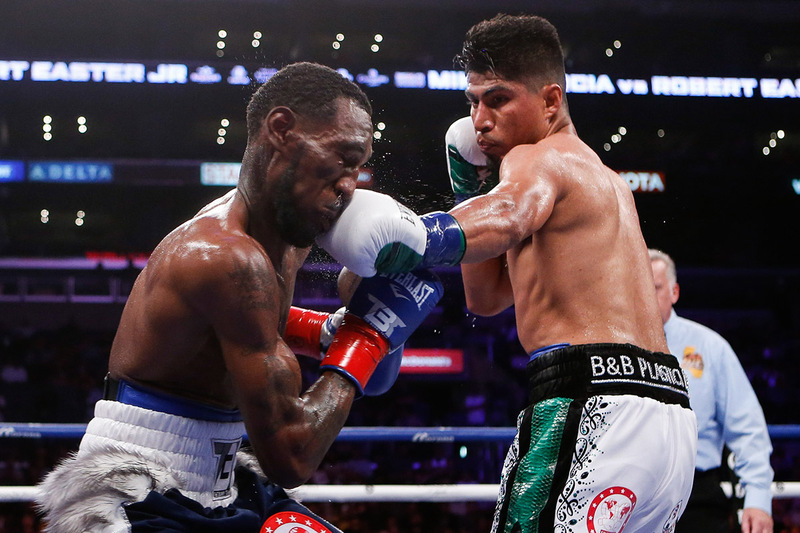 IBF/WBC LIGHTWEIGHT TITLIST MIKEY GARCIA (LEFT) VS. ROBERT EASTER JR.
Saturday, July 28, 2018: For the first eight minutes and 34 seconds against IBF counterpart Robert Easter Jr., WBC lightweight titlist Mikey Garcia – boxing’s proudest promotional free agent – was not in full control of his surroundings. Easter’s prolific jabbing and constant movement – as well as Garcia’s cerebral perfectionism – resulted in Garcia not throwing a punch for the first 60 seconds, and firing only two in the first minute-and-a-half. 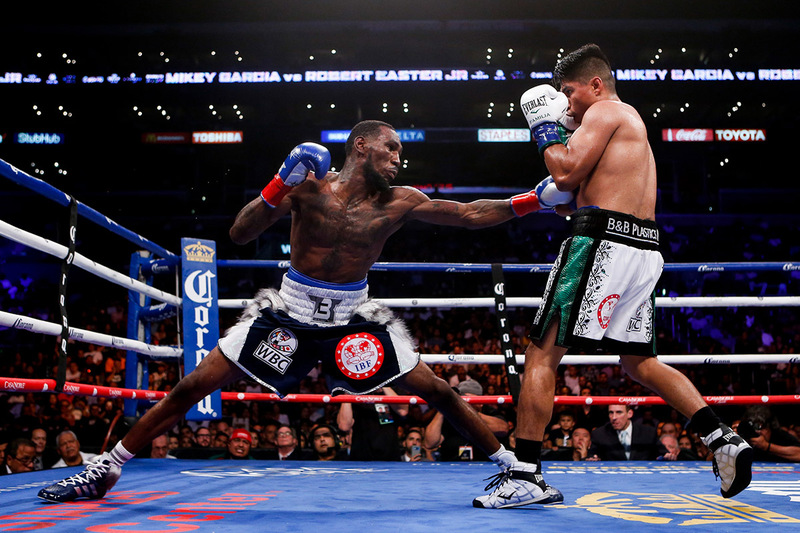 While Garcia stalked and surveyed, Easter piled up punches and points, and appeared to easily win the first two rounds. According to CompuBox, Easter threw more than twice as many punches (102-45), and out-landed the heavily-favored Garcia in every phase (24-6 overall, 17-3 jabs, 7-3 power). It looked like, at least early, that Easter had found the blueprint by which he could score a monster upset. All he had to do was to continue doing it for the next 10 rounds – a task much easier said than done. Through his first four comeback fights following his two-and-a-half year quest to break away from Top Rank and seize command of his own destiny, Garcia had quieted those who criticized his achingly slow starts by being more proactive against Dejan Zlaticanin, Adrien Broner and Sergey Lipinets, the details of which can be found in Part One. Against Easter, however, the fists that produced 30 knockouts in 38 fights – though none since January 2017 – were largely silenced. That concerning pattern continued through the first two minutes of round three, as Easter out-threw Garcia 35-14 and out-landed him 7-5. But as the clock ticked under the 30-second mark, Garcia finally spotted the opening he wanted to seize upon: Following a hard jab, Garcia snapped a right cross over Easter’s egregiously lowered left, after which he floored him with a whistling left hook. Easter regained his feet even before referee Jack Reiss turned toward him and counted “three” but, in that instant, the fight’s dynamic had been dramatically reset. With two flush punches to the jaw, Garcia confirmed not only that he owned enough power to hurt Easter but also that he could deliver his power from the proper range, and do so without losing balance, leverage or positioning. That knowledge bolstered Garcia’s already robust self-confidence, and established the foundation for his subsequent success. 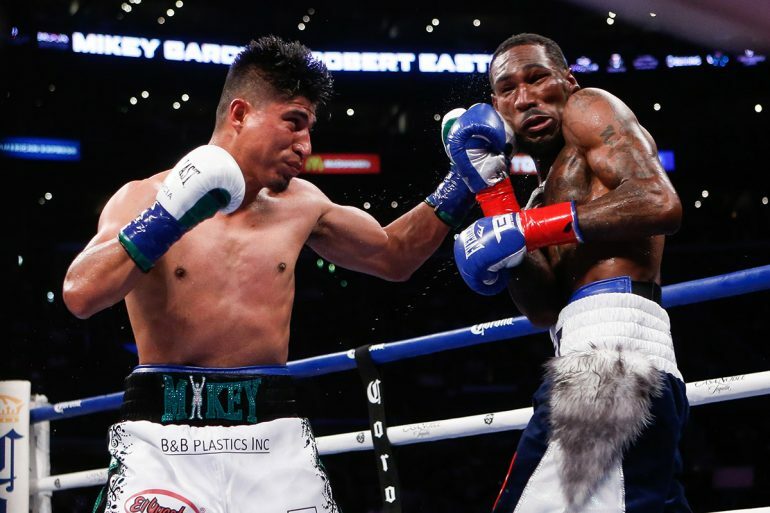 Mikey Garcia (right) was too much for fellow lightweight beltholder Robert Easter Jr. to handle, but what happens if he takes on welterweight destroyer Errol Spence Jr. next? Entering the fight, three statistical questions were on the docket. Two of them had been already answered – Garcia’s early volume (anemic) and Easter’s jab success (sizeable, at least at first) – but the third remained in question: Given Easter’s willowy frame, would Garcia break precedent and target the body more? That was a legitimate query because in Garcia’s last nine fights, only 13.9% of his total connects were to the body. Starting in round six, he began to formulate a response, as four of his nine power connects struck the flanks, but the real answer occurred in the ninth when Garcia finally let loose with his entire arsenal. In his best round of the fight, Garcia unleashed 88 punches, landed 32 overall and 22 power shots, of which nine struck the body – all highs for the fight. Though that trend didn’t last – Garcia landed only 28 body shots among his 176 total connects (15.9%) – it told Easter that Garcia was willing to expand his hitting zone, which, in effect, forced Easter to defend more area and thus become more hittable. And Easter indeed became more hittable. In rounds nine through, 12 Garcia out-landed Easter 95-34 overall and 58-13 power, and, in doing so, Garcia connected on 42%, 47%, 53% and 44% of his power punches, a far cry from the power accuracy Garcia logged in rounds five through eight (25%, 32%, 26% and 14%). Also as if to twist the knife further, Garcia, in spite of his eight-inch reach deficit, found much greater success with his jab, as he out-landed Easter 37-21 in the final four rounds. Better yet for Garcia: In Easter’s previous 11 CompuBox-tracked fights, the most jabs an opponent ever landed in a given round was eight (Argenis Mendez, round two); Garcia broke that mark three times – nine in round four, 10 in round nine and 14 in round 11. Garcia’s surge in the fight’s final third enabled him to pull away on the scorecards, as well as the stat sheets. Garcia led 176-129 overall and 99-40 power, and was the more accurate hitter in all phases (32%-25% overall, 27%-26% jabs, 38%-24% power). Yes, Easter’s 343 jab attempts and 89 landed jabs are the most ever by a Garcia opponent tracked by CompuBox (Matt Remillard’s 338 attempts and 79 connects were the previous marks) but that offered little solace for the wide scorecards (118-109, 117-110, 116-111). Another plus for Garcia: Despite his deliberate start, he ended up throwing more total punches than Easter (555 vs. 507), and that’s because Easter’s output dropped from 48.7 per round in the first seven rounds to 33.2 in the final five. Moments after the decision was announced, the focus turned to a potential showdown between Garcia and IBF welterweight king Errol Spence Jr., who was at ringside. Spence arrived at press row not long afterward, and the subsequent scrum kept Dennis and me in place for several minutes later. IBF/WBC lightweight titlist Mikey Garcia (right) vs. Robert Easter Jr. While I will join the herd in picking Spence to smoke Garcia, I, along with other veteran observers, know history tends to repeat itself. As I type this, my mind, as it often does, drifts back to the 1980s when Sugar Ray Leonard built his legacy by pursuing – and conquering – adrenaline-pumping challenges. Like Leonard before his fights with Thomas Hearns (fight one) and Marvelous Marvin Hagler, Garcia draws strength from those who dismiss his chances against Spence. It’s a dynamic Garcia hasn’t yet felt as a pro, and, while many elite boxers like Garcia would take umbrage at his chances being so universally dismissed, the fighter himself is actually thrilled by it. That’s because Garcia has been the prohibitive favorite going into virtually every fight of his professional career, and, because he has disposed of every opponent with the expected ease, he feels his successes have been taken for granted and will ultimately be diminished by historians. Entering his first fight with Hearns, Leonard rightly believed the result would strongly define his place in what would become the era of “The Four Kings.” He had already split two fights with one of them (Roberto Duran), and, while the manner in which Leonard conquered Duran superseded how Duran defeated Leonard (Leonard not only won but made boxing’s ultimate macho man quit), Leonard still felt he had much to prove against the fearsome Hearns, who was a 7-to-5 favorite on fight night thanks to a flood of late bets. His come-from-behind 14th round TKO over Hearns was an instant classic that enabled Leonard to become an undisputed champion, in addition to becoming an undisputed crossover superstar. While Leonard’s place in the sport reached a stratospheric level after the Hearns win, it wouldn’t last because he fought just twice more over the next six years (TKO 3 Bruce Finch, an off-the-floor TKO 9 over Kevin Howard). But if Garcia is looking for genuine challenges, he need not look any farther than The Ring Magazine/WBA counterpart Vasiliy Lomachenko, and, if he wants a preamble, he could face the winner of August 25’s WBO lightweight title fight between champion Raymundo Beltran and Jose Pedraza. In a perfect world, it makes sense for Garcia to look toward the Beltran-Pedraza winner because, should he win and become a three-belt titlist, he would generate enormous negotiating power. But boxing’s world is never perfect, and politics lie at the heart of it all. Ask virtually every champion what he wants to do next, and he’ll always say, “Unify the titles.” So why doesn’t Garcia want to unite the 135-pound belts, as Terence Crawford did at 140 and The Ring cruiserweight champion Oleksandr Usyk did at 200? The answer: Lomachenko, Beltran and Pedraza are promoted by Top Rank – the entity Garcia spent years trying to escape. Conversely Spence fights under the Premier Boxing Champions umbrella (and Garcia, though a free agent, has fought on PBC cards), and, with no big-money fights looming at 140, Garcia sees Spence as his easiest-to-secure, as well as his most lucrative option, within his self-imposed limits. I applaud Garcia for daring to be the greatest he can be. If he wants to become the best fighter of his generation, he needs to break through the noise, and make as much history as possible in the approximately three years that remain of his physical peak. I understand why he’s doing what he’s doing; given all the time and effort he sacrificed in breaking away from Top Rank, he’s not about to put himself anywhere near Arum or his fighters but, to me, a Spence fight should represent the culminating fight of a long and storied build-up toward immortality that has, so far, been immaculate. By jumping up two weight classes to face a younger, bigger, stronger, faster and harder-hitting opponent at his positive peak, Garcia is jumping ahead several hundred pages in his well-crafted novel. Five different books have carried the title “A Fool’s Errand;” let’s hope Garcia’s next fight won’t inspire a title of the same name.